Dum Aloo Kashmiri Recipe How to Make Kashmiri Dum Alu creamy cashew-almond gravy for the Dum Aloo Kashmiri. Dry roast cinnamon sticks, cloves, green cardamom, star anise, bay leaf, coriander seeds, cumin seeds and fennel seeds on a medium flame for a minute. Dry roasting the spices brings out their natural oil which makes the gravy very flavourful. Transfer the dry roasted spices to a... In Kashmiri dum aloo the curry is made with curd and flavourful spices like dry ginger powder & fennel seed powder. Here, in this Restaurant Style Dum Aloo Recipe, cashew nut is the star. The curry gets a very rich taste and flavour by using cashew paste. In Kashmiri dum aloo the curry is made with curd and flavourful spices like dry ginger powder & fennel seed powder. Here, in this Restaurant Style Dum Aloo Recipe, cashew nut is the star. The curry gets a very rich taste and flavour by using cashew paste.... 17/01/2017 · Kashmiri Dum Aloo is a dish from the Kashmiri cuisine that is made with baby potatoes in a rich and spicy curry. 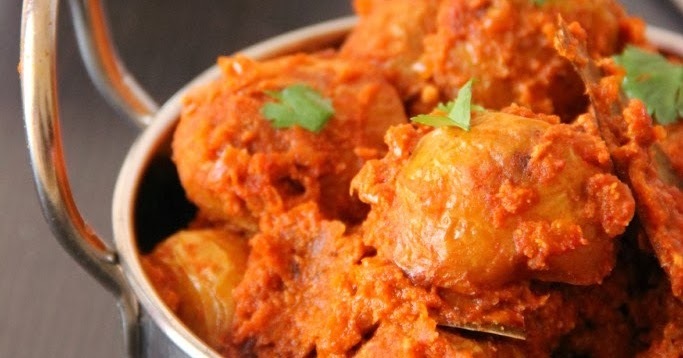 This baby potato curry from India also known as Dum Olav or Dun Aloo, dum aloo is usually served with rice. Kashmiri Dum Aloo is a very popular dish that is among the first options for a vegetarian side dish. A spicy semi-dry curry with a distinct reddish orange color (due to the presence of the Kashmiri... This recipe of kashmiri dum aloo is more similar to the way the real kashmiri dum aloo is. not the eatery ones. what is served in eateries as kashmiri dum aloo isn't the genuine stuff and is really a rich, sweet sauce based dum aloo. How to make kashmiri dum aloo Scrape the aloo (potatoes), prick all over with a fork and soak in the water with little salt for 2 hours. Dry the potatoes on a cloth and heat the ghee or oil. 17/01/2017 · Kashmiri Dum Aloo is a dish from the Kashmiri cuisine that is made with baby potatoes in a rich and spicy curry. This baby potato curry from India also known as Dum Olav or Dun Aloo, dum aloo is usually served with rice. To go with my Kashmiri Rotis. and Saffron rice, I made this Kashmiri Dum Aloo. This curry is so delicious with stuffed potatoes that is served with a spicy, creamy gravy.